Its not proper 'bus wars' in Plymouth just yet, but this week has seen the latest 'skirmish' between Plymouth Citybus and First D&C. It does seem a strange choice for First in that it is virtually the same as Citybus routes 61/62 between the City Centre and Honicknowle and its not exactly the top performing route of Citybus - other areas of Plymouth would on the face of it seem a better bet to launch competition on. I have yet to see the route in action so it remains to be seen how popular or otherwise it proves to be. Certainly Citybus have yet to react to the competition - I am sure they are keeping a very close eye on things though and wont be scared to come out fighting if they need to. The few drivers I have spoken to all expect the competition to continue for a while yet but not to the same extant as the last proper bus war. As to which side will 'win' we will just have to wait and see. Things are getting interesting! To be fair, Honicknowle did not have any First services to begin with. 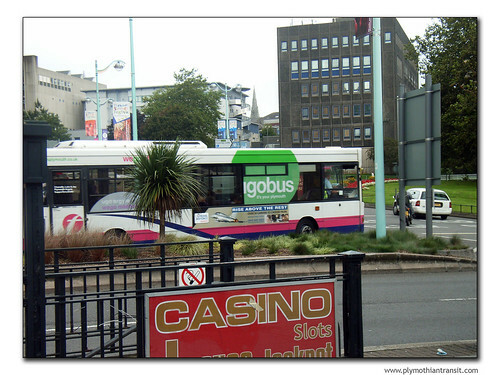 Citybus broke into Plymstock which was a First monopoly, so fair enough. Typical though that when I needed to travel to Honicknowle I had to get 2 different company's tickets, but now I don't go there 1 will surfice. The reason first "invaded" St Pancras Avenue and Peverell Park Road was because Citybus had "invaded" Yellow Tor Road in Saltash.